The oldest part of today's village was probably Great Sutton which was the area around the church of St Leonard and the land to the west. Little Sutton was a small hamlet in the area of Glebe Farm. The Anglo Saxon period with the use of oxen and ploughs saw the land around these settlements begin to shape the fields which can largely be recognised today. Eastleigh (probably spelt at the time Iglea) Wood lies a few miles to the west of Sutton Veny. This is thought to be the place which King Alfred reached on the second day after he entered Wiltshire in 878. In 1086 the Domesday survey recorded that there was an estate of 4 hides at Sutton Veny held by Nigel the Physician from the Abbey of St Mary de Monteburg. (A 'hide' was 120 acres or 50 hectares, and most free peasant families at this time had a quarter of this amount.) There were many estates around Sutton Veny owned by wealthy landowners and they changed ownership many times over the years. The Hungerford family held much of the land in the area up until about the 15th century. From the Neolithic age right up to the 19th century, the economy of the Wylye Valley region has depended mainly on sheep farming and the manufacture of cloth. Records show that in the 11th century wool from this region was being exported to France, and between 1417 and 1436 Sutton Veny contributed between 400 to 600 fleeces per year to the Hungerford wool store. 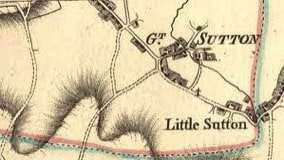 Below are some old maps of Sutton Veny showing Great and Little Sutton. The image on the far right is of the Parish in 1890 with the modern day parish boundary superimposed on it. Sutton Veny and the Wylye Valley suffered as the rest of the country did in the 14 century with bubonic plague which was also known as the 'Black Death' or the 'Great Plague'. This disease coincided with agricultural depression and famine in the region. The dissolution of the monasteries and the reformation came and went, and to the farmers in Sutton Veny in the mid 17th century, a key improvement was the introduction of the now very rare breed of sheep called the Wiltshire Horned which was an extremely good fertiliser of fields. It had a short fleece and long legs, and could cover up to 40 miles a day - a true walking dung cart ! 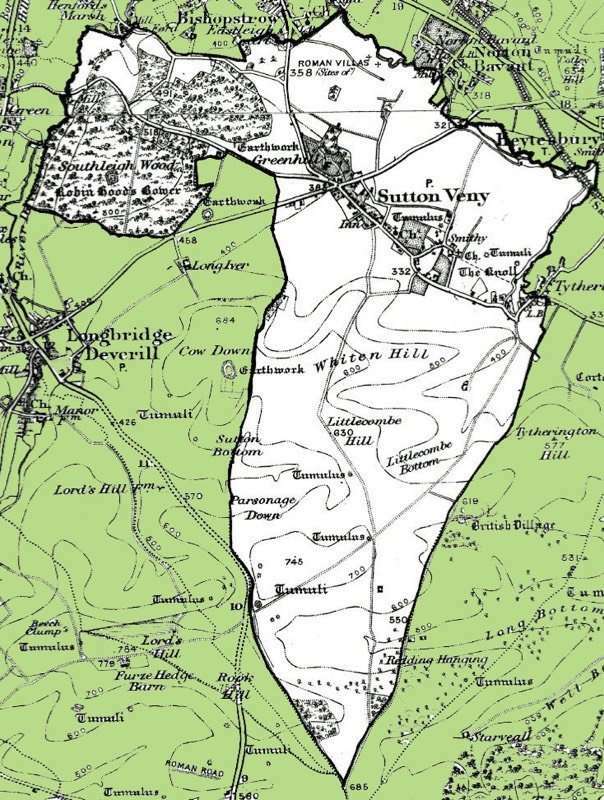 The Civil War in 1630 ravaged Sutton Veny and the remainder of Wiltshire as the county leaders opposed King Charles. There were many battles in the local area concentrating mainly in Bristol, Devizes and Wilton as both sides fought to gain control. The men from Sutton Veny would all have been involved and the farms would have been left to the women and elderly to maintain. Normality returned in the late 17th century. The 18th Century saw the introduction of water meadows, the enclosure of formerly common fields and the introduction of one of the first power driven shearing machines at Horningsham. 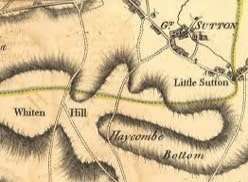 In the early 19th century life became extremely hard for the inhabitants of Sutton Veny and the whole of Wiltshire. The county was one of the poorest in the country. High farm rents made life very difficult for the average farmer and the severe agricultural depression that followed led to riots in towns and villages. The high street of Sutton Veny had its open ditches by the side of the road replaced with brick gutters, the remnants of which can still be seen today by the Parish vestry who were concerned by the insanitary state of the village streets. One of the largest estates in Sutton Veny was the Greenhill Estate (now Sutton Veny House) originally owned by the Hinton family, bought in 1850 by Joseph Everett and considerably improved and extended in 1856. Also in this year the railway line opened between Warminster and Salisbury.